This second part of this month's Daring Bakers challenge was the best. The Milanos were decent, but these are pretty great! Just like Mallomars. Except better, because they're homemade and gluten-free. These are a big, messy, production, but fairly straightforward. I won't make these again until it's cooler outside. This is not a good project to do on the hottest day of the year so far. 7. Roll out the dough to 1/8-inch thickness, on a lightly floured surface. Use a 1 to 1 1/2 inches cookie cutter to cut out small rounds of dough. I ended up rlling my dough into small balls and then flattening each one, it's waaaaay too hot to roll out cookie dough. 1. Melt the 2 ingredients together in the top of a double boiler or a bowl set over barely simmering water. I melted mine in the microwave. If your glaze seems too thick, add a little more shortening. Love your pictures! And your piped marshmallow came out perfect. Yum!! All of your cookies look amazing - Beautiful job on this challenge =D. I love your photos! You really are amazing, and I just might be a little bit in love with you. That last picture is AWESOME! 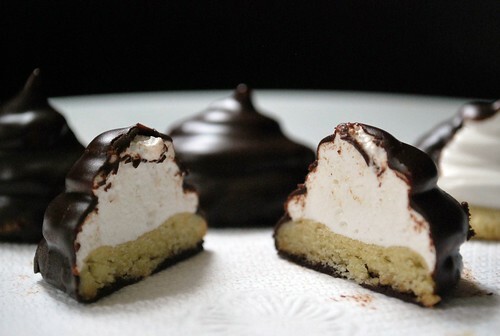 I love that you used a darker chocolate--I can't believe those Mallows are gluten-free!! Great job! WOW!!!! Those look absolutely incredible - and your pictures are fantastic. Beautiful mallow mounds. Well done, indeed! mmm, awesome job. They look so good! your photos are awesome, too! I agree with Lisa perfection! Love the cross section photo! wow, these look really proffesional! well done! Oh my goodness! They look delicious! When I saw those photos I was like "yes!" jumping up and down in my chair "there you go, the epitome of gluten-free perfection!" Thanks! 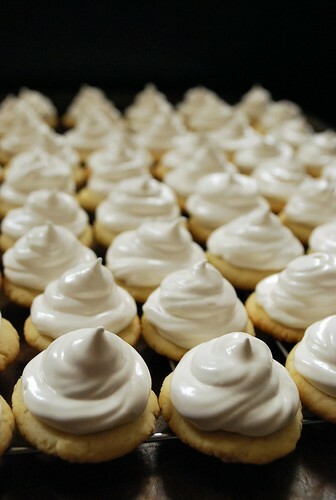 Now that I know it's possible I can make these for my 8 months pregnant sister, she loves marshmallow and chocolate. holy heck those are purty! what a lovely job on both challenges. 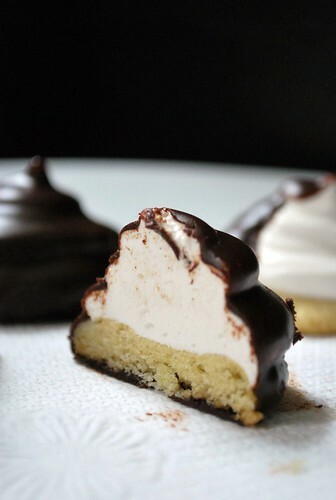 Mallomars were my mother's favorite cookies before we both discovered we had celiac disease. I made these for her as a Hanukkah present and they were truly amazing! Thank you sooo much!